11 games, 11 wins, 25 goals scored, 2 goals conceded, from 8th place and 8 points off the pace to 6 points clear at the top of the table. This is, of course, Chelsea’s record since Conte changed to a 3-4-3 formation. These results are impressive regardless, however, they become even more impressive when the quality of the opponents are taken into account. On this stellar run the Londoners have beaten, Leicester, Man Utd, Spurs, Everton, Southampton and Man City amongst other tough challenges. 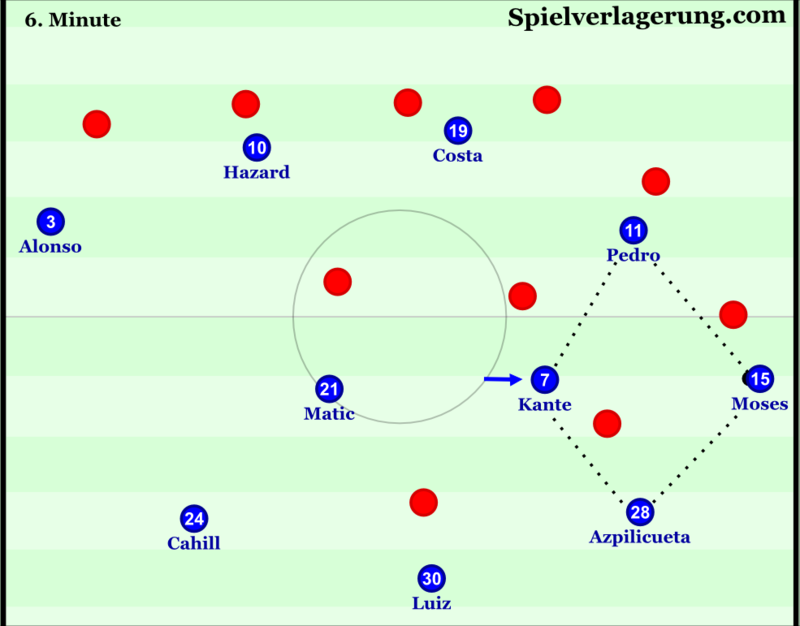 Formations are, of course, merely a starting point; this piece seeks to analyse the finer details of Conte’s system and why it has been so successful. One of Conte’s preferred attacking methods is the use of combinations in wide areas. Thus he sets his teams up with movement patterns that facilitate this. However, in Chelsea’s early season 4-3-3 shape, this often led to a major problem; namely the lack of central occupation. A strong central occupation is naturally important due to the advantages it has in connections. By occupying the centre, teams can switch the ball through it to different areas of the field if they cannot break through in the initial area. 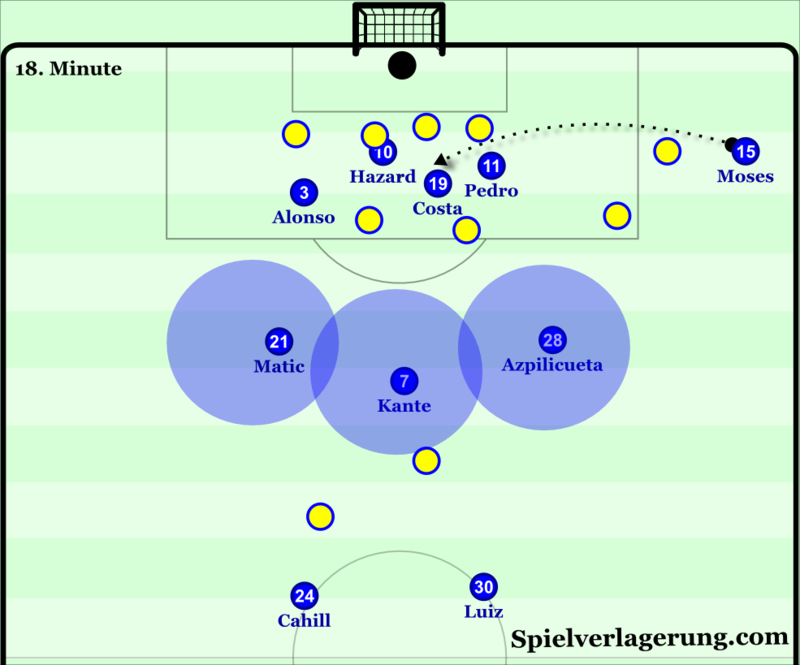 In the 4-3-3 shape, the wide movements of the central players left the centre of the pitch largely unoccupied and Chelsea thus experienced difficulties in connecting attacks from wide areas to other areas. This was at times the case in deep midfield but a lager problem was a weak occupation of central areas behind opposition midfield lines. With little threat of recipients behind them opposing midfield lines could press forward more aggressively and limit the space for the likes of Kante, Matic and Oscar. This contributed to the difficulty Chelsea experienced with switching attacks. Whilst switches were at times executed, they were often done through lofted balls from one flank to the other. Whilst these passes can change the point of attack, they can have a number of natural disadvantages. Firstly, an aerial ball naturally becomes more difficult to control which is not a problem in itself, but becomes one when the recipient is under pressure. This pressure becomes more likely with lofted aerial balls as the time it takes to reach the recipient gives the opponent time to get into position. 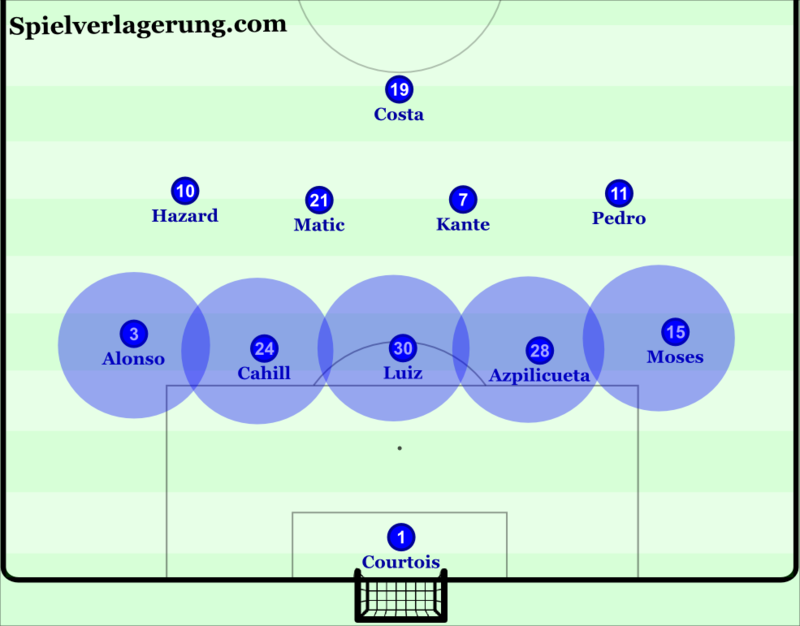 However, within the 3-4-3 shape Chelsea have found a greater capacity to connect wing attacks through the centre to other areas. With a number of simple but effective dynamics the Stamford Bridge outfit are able to retain central presence, width and structures for wide combinations. Key to this is the positioning and movement of midfield pair Matic and Kante. To create a stable structure to connect possession from the flanks the ball-near midfielder often moves in a way to create a diamond shape. This shape theoretically offers the ball-carrying wing-back a diagonally forward and backwards pass as well as a simple sideways pass back infield. As such, the ball-near midfielder is tasked with moving into the nearby half space to offer the sideways pass. The focus on wide diamonds allows for adaptable behaviour, meaning they are required to interpret the shape and fill any vacant position to make a diamond. An example of opponents focusing too much on preventing midfield connection: this pass went straight from Moses to Costa! The routes Chelsea use to connect back from wide areas infield is dependent on the behaviour of the opponent. When opponents focus on preventing the back pass to the side back or Luiz, space often opens up in midfield for the ball-near midfielder to receive and switch the ball across. However, switching via Luiz/the side back is often a possibility against opponents who focus on blocking routes to switch the point of attack through the midfield. Some opponents however operate in an intensely man-oriented fashion on the ball-near side allowing them to press the pass into midfield and the back pass to Luiz. In these situations, the movement of the ball-near midfielder is vital. With slight adjustments to their position they have the ability to open passing lanes to escape from the opponents’ pressure. This is at times done through the ball-near midfielder moving up. If they are successful in taking their marker into a deeper position the route to switch the ball across to the ball-far midfielder often becomes available. By connecting possession through central areas Chelsea access another benefit which is the ability to create increased space in wide areas for the eventual receivers. Since the centre of the pitch provides the quickest route to goal it is the immediate priority of defensive teams. Therefore when a team are able to play through central areas opposing wide players can be drawn infield to press whilst the ball goes out wide into the space they leave. This ability to “mis-direct” an opposing defence (go against the grain) is crucial and is a tool for creating time and space on the ball. 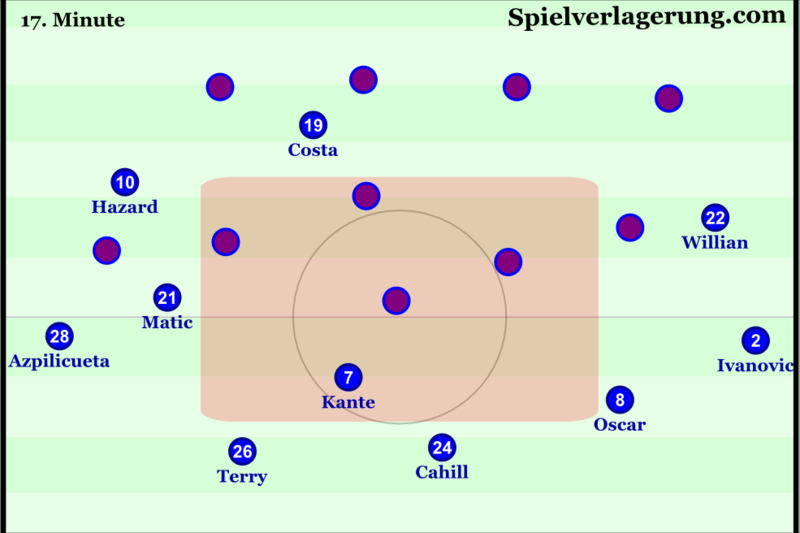 The base of Chelsea’s wide diamond shapes is largely filled dynamically by the side backs; Azpilicueta and Cahill. With 3 players in the first line of build-up Chelsea can effectively cover and circulate the ball beyond the width of both half spaces. This increases the distance opposition forwards need to make up to create access and gives the London side a stable base for circulation. This is particularly the case since their back 3 often gives them an immediate overload against the opposition’s front line. This stability, overload and security of the extra man in the first line allows the side backs to advance with the ball aggressively into midfield. One interesting aspect is the side backs’ movement after switches, and in particular the timing of their advances. If Matic were to receive a pass from the right and opens his body out to play to the left flank, Cahill will be seen advancing in the left half space to receive, the same is evident on the right. This timing allows them to receive the ball with a positive momentum, which allows Chelsea to maintain a strong circulation rhythm. This is, of course, a small detail but one that can have a positive impact on the rhythm of a team’s possession game, and its efficacy. With the two midfielders focused on the ball-near half space and centre, it is important for the receiving side back to carry the ball forwards into a midfield position. This is particularly important after the ball has been switched since the midfield pair will require a period of time to shift over and occupy positions closer to the ball. The influences on the pass selection of the side backs in these situations is an important aspect in Chelsea’s possession game and perhaps the major influence is the structure of the team. A particularly important structure that is key in influencing the decision making is the level of support around the potential receivers. As noted earlier, the midfielders Matic and Kante require time to fill the nearby half space and centre after switches. Thus the support in wide areas is not immediately optimal, this makes the side backs reluctant to pass the ball out wide in fear of the wing-backs being isolated. There are a number of typical reactions to this issue. Firstly the use of the dribbles are highly strategic, one if its several uses is to control the rhythm thus giving the midfielders time to shift across and support the ball in wide areas. The primary option, however, is to look for a pass into central areas, often a vertical one into the inside forward. If the opponents press intensely in these situations and the receiver cannot turn out, the ball can be set back to the wing back who curls a first time long pass beyond the opposition defence. If there are no available passes into the centre for Cahill or Azpilicueta to play into the centre they can use the pass to the wing-back as a last resort but they may be required to offer the passing option back infield. In these situations a simple rotation occurs whereby the nearby midfielder would drop to occupy the base of the diamond in reaction to the side back remaining high in midfield. One of the most distinctive features of Chelsea’s current game is the methods they use to bypass pressure after making a progression. Of course advancing towards goal is the objective of the possession team and preventing this is one for the defending team. It follows, therefore, that a level of pressure will follow when a possession team make significant progressions towards goal. 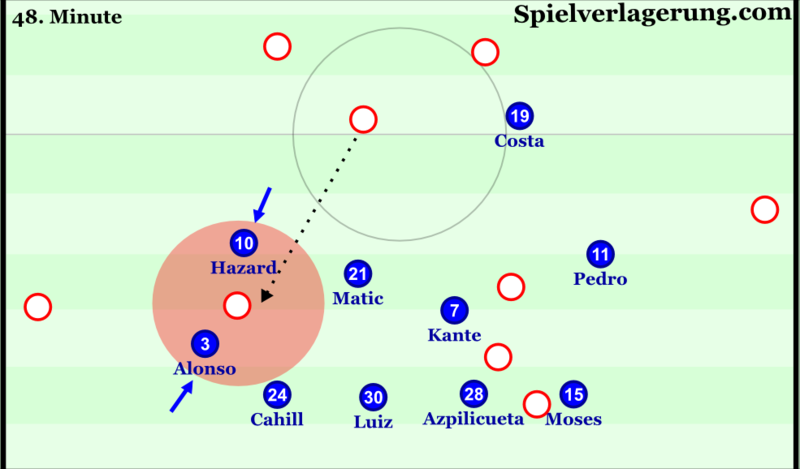 Within the early season 4-3-3, the wide players; Hazard and Willian were required to give width which often led to large distances between them and Costa up front. 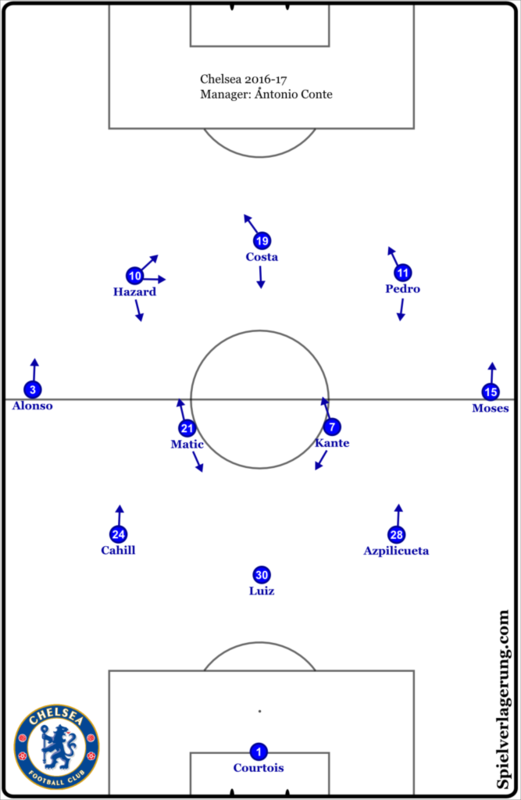 Since they were acting far apart from one another Chelsea’s attackers struggled to combine between themselves consistently, and Costa was at times isolated up front. However in the current formation the wing-backs provide the width meaning Chelsea’s attackers can operate with shorter distances between them thus facilitating more consistent combinations. One interesting factor in the 3-4-3 how the roles and positioning of the forward players changes slightly when Chelsea progress from deep. Initially the forwards have their natural roles in maintaining strong spacing for a strong circulation game. This often sees Hazard positioned high in the left half space, Pedro the same on the right and Costa occupying the centre. However once one of them receives the ball, the positional freedom is greatly increased and they can be seen moving to create structures for dynamic combinations. Chelsea use a number of combination patterns to bypass this pressure as they seek to secure the ball in the advanced area and gain a dynamic advantage to create a dangerous attack. One such method is a Conte trademark 3rd man run and his Chelsea side have even displayed a number of different 3rd man patterns. One of these is a pass to one of the wide forwards who drops towards the ball, dragging an opposing full-back with them. Hazard or Pedro would then let the ball run through their legs turning the pass into a through ball for the onrushing wing-back. Most players are taught to defend the most immediate danger, thus when the wide forwards look primed to receive in a central position Alonso/Moses’ original marker often become drawn in. However, in this situation Hazard/Pedro simply act as a decoy, and these features allow the wing-back to receive in space on the flanks. Another 3rd man variation can be seen when the opponents are sufficiently un-compact and leave central spaces exposed. The key to this pattern is the ability to pass into Costa in advanced central areas. This is a trigger for one of the wide forwards to make a diagonal run between the opposing centre back and full-back. By running between two opposing defenders Chelsea can cause miscommunication and overcompensated positioning. This can make the centre back and full-back move deeper and more narrowly respectively as they attempt to cover the run. The pass selection in response from Costa is based on the reaction of the opponent, particularly the full-back. If the opposing full-back holds their position in anticipation of the pass out wide, Costa can play the inside forward through the space between the opposing full-back and centre back. If the opposition full-back moves infield to track the run, Costa can turn and pass into the wing-back who is often in large space to receive and advance the attack down the flank. There is a common theme with all these combination variations; namely the focus on using the opponents’ pressing dynamic against them as a tool to progress into more dangerous areas. 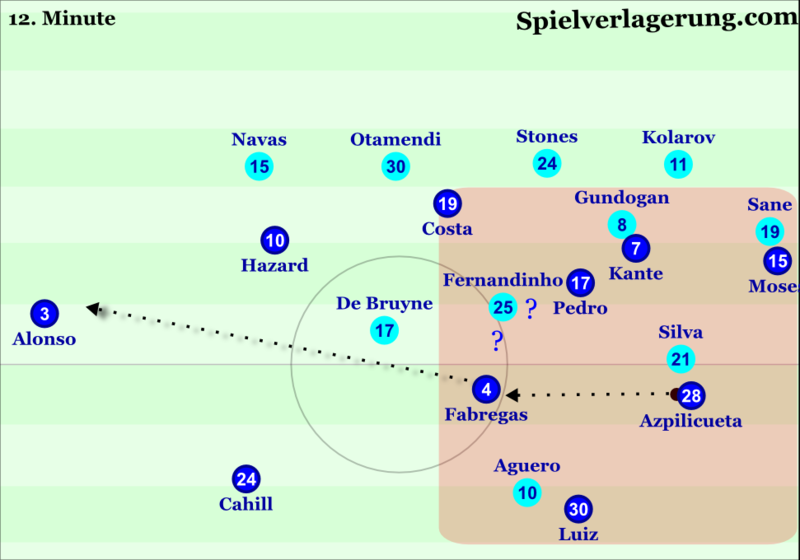 With opponents naturally drawn to press intensely when Chelsea make a progression, the Blues create the capacity to advance beyond the opponents’ pressure. Two crucial factors in this are; re-locating the attack and possessing superior timing to the opponent. By re-directing the attack Chelsea can retain the advantages of advancing towards goal whilst moving the ball away from the pressure that often forces turnovers. Of course to do this it is vital to possess superior timing to the opponent. Without this, the likelihood of attacks breaking down increases as the pressing advances of the opponent becomes more problematic. One factor that assists the attackers in these situations is a natural result of beginning their runs before their opponent. Due to this, the likes of Hazard and Costa can create the necessary separation from their opponents to receive the ball, whilst still enticing them forward to press. The system switch has also had positive effects on the individual performances of the agents within it and this is perhaps most notable in the case of Eden Hazard. On the most basic level, the width from the wing-backs allows Hazard to act not only closer to his fellow attackers, but also more consistently in his favoured action zone; namely the left half space. Since they occupy the same role, Hazard and Pedro have many of the same action patterns, however there is one major difference which is the higher level of freedom the Belgian forward is afforded. With the ball on the left side, Pedro is often tasked with giving depth with advanced positioning and threatening the opposition’s defensive line with diagonal runs. In Hazard’s case, he has the licence to drift over to the right flank, create overloads and participate in combinations there. His diagonal runs beyond the oppositional full-back are another interesting feature of Hazard’s role, and these runs often allow him to reach the byline to look for a cutback, cross or even shooting opportunity. It often follows that the players responsible for providing connections are also tasked with providing cover and stability against turnovers. Since providing connections requires constantly good distances from the ball in possession, this easily translates into good positions to defend in the immediate aftermath of losing the ball. Matic and Kante therefore are the primary individuals concerned with stopping counter attacks. When in advanced attacking positions they are generally positioned on the edge of the box to block the main exit routes for counter attacking opportunities. In order to cover the centre and both half spaces the midfield pair are often joined on the edge of the box by either the ball-near side back or the ball=far full-back. In addition to the two remaining centre backs, this gives Chelsea the ability to either force quick regains or simply control counter attacks by slowing the opponents down giving the rest of the team time to drop into the defensive shape. The system change has noticeably had a positive effect on Chelsea’s game without the ball, with 9 clean sheets in the 11 games since. Perhaps the biggest benefit is the greater width in the defensive line. Chelsea’s base defensive shape, and the areas of prime responsibility across the backline. Against the ball Chelsea operate in a 5-4-1 shape with the wing-backs acting alongside the 3 defenders to make a back 5 whilst the inside forwards drop to positions alongside Matic and Kante to create a line of 4 in midfield. Many teams struggle to defend the width of the field effectively in a back four shape, whilst retaining an adequate presence in the box to defend any potential crosses. This leads to the situational use of midfield players to cover spaces which often manifests in wingers dropping into full-back positions or at times central midfielders covering channels between pressing full-backs and centre backs in central areas. Within Chelsea’s early season defensive shape it was often the former, with Hazard or Willian situationally being used as 5th defenders to assist with more effective width coverage. However this can lead to a number of problems; firstly the constant re-adjustment in terms of operating in the midfield or defensive line can create difficulties in co-ordinating effective positioning. This is particularly the case against opponents who shift the ball quickly and can therefore take advantage of any issues in the timing of dropping into the defensive line. Furthermore this can at times mean using players who have sub-optimal defensive instincts in important defensive positions, which can create a target for opponents. Most of these issues can of course be neutralised with strong and effective team tactical training, however it is more difficult to co-ordinate. Another issue is directly related, since the use of players like Hazard in such deep positions creates longer distances to join any counter attacks. With the constant back 5 shape and effective work on the training field, Chelsea have been able to solidify their game against the ball. The 5-man defensive line means the defence can cover more width on the field whilst retaining adequate distances between themselves. This means the ball-near wing-back can defend wider and move to defend opposition wingers quicker, with this they are able to prevent opponents from gaining a dynamic advantage for take-ons and can force them to go backwards. The level of cover is an important influence on the level of pressing individual players feel comfortable enough to execute. This sounds obvious, but has an interesting natural effect in different defensive shapes. On a simple level, the line of defence where a team has the highest number often becomes the area of most intense pressing. This is due to the level of cover for each individual player being at its highest. In a 4-5-1 defensive shape this can lead to particularly aggressive midfield pressing, but in Chelsea’s 5-4-1 it creates a “last-line security” for the individual defenders to aggressively close spaces in front of them. This security that the 5 man defence creates, naturally allows the ball-near defenders to situationally mark their direct opponents, at times following deep in their attempts to prevent them from receiving in space between the lines or turning towards goal. This creates an interesting effect in the event of the midfield line being penetrated in central areas. In these situations Chelsea pair aggressive pressing from one of the defenders, depending on the part of the pitch, with backwards pressing from the midfield players. This creates a high intensity, high pressure environment that allows Chelsea to force the ball away from these dangerous areas. The four midfielders defend in a position-oriented manner with their focus being primarily on occupying strong positions in relation to the ball’s location to block important spaces in front of the defence. However, the scheme is not wholly passive as the nearest midfielder to the ball steps forward to press the ball carrier. Regaining the ball is not the primary intention, but by applying a level of pressure on the ball they seek to control the opposition’s circulation by reducing the ball carrier’s time to make dangerous passes. Within the position-oriented zonal defence, as with any other zonal defence, there is a high level of team-mate orientation this means the players are constantly adjusting their positions based on not only the ball but also the actions of their team-mates. When a midfielder steps forward the surrounding players narrow up and deepen slightly to provide extra cover in the space just vacated. Furthermore, with the 5-chain in defence able to defend large width, the midfield can focus on securing the centre with less emphasis on shifting to wide areas. On this run, Chelsea have shown their ability to beat a range of strategically variable opponents and in different fashion. Goal filled and wholly dominant wins over Everton and Man Utd have been accompanied by tough and transition focused wins over Southampton, Spurs and Man City and single goal wins over West Brom, Middlesbrough and Crystal Palace. This is perhaps the most imperious aspect of their title charge thus far, and it is no surprise that they have more points than any of the last 4 teams to be top of the table at this stage. The formation switch has certainly had positive effects on the side in all phases of the game and the Stamford Bridge outfit now resemble a typical Conte team more closely. Over the last 11 games the London side have arguably been the finest side in the league from a tactical perspective with a particularly strong balance between stability and creativity. If Chelsea are able to maintain this balance between defensive stability and offensive output the Italian coach could well be celebrating the Premier League title in his maiden campaign. Do you think this formation will be successful with big teams like Barcelona/ Real Madrid or Bayern? or what changes he will have to do against this team to be successful ? That completely depends on the players. Ronaldo and Bale are a lot different from hazard and pedro. Benzema too is quite different from Costa. In barcalona , Busquets may not play with the same efficiency as he does as a single pivot as compared to double pivot. Neither can InIesta play in that. Sorry. i think you misunderstood my question. i meant chelsea is playing great against premier league teams with this formation. will Chelsea be effective against big teams like Barca, real and bayern if they play against these teams with same formation. or do you think big teams would be able to exploit some weakness in this formation? Can you do one for Boca Juniors under Guillermo Barros Schelotto? What is impressive is the speed with which Conte has transitioned Chelsea to the 3-4-3 formation and playing this astutely. Compared to Pep and Klopp, Chelsea is exhibiting quicker team learning. Any clues as to how Conte has transferred his message? What are his coaching methods that has allowed Chelsea to quickly absorb this new way of playing? Conte has even brought out the best in Hazard, Costa, Pedro and Moses of course. I don’t have details on his coaching methods, but I’d assume he coaches with a lot explicit tactical detail and also perhaps quite repetitive drills to train his various patterns. There are of course pros and cons with that type of approach. Another typical Contesque combination is with both wing backs high on the pitch, Hazard and Costa starting from the same height but Hazard coming deep in midfield attracting one of the opposition centre backs and Costa or Pedro from the back making the run forwards, then a long pass from someone like Luiz or Fabregas. For instance Costa’s goal against Man City. Compare it also with Giaccherini’s Goal for Italy vs Belgium. Who said Santa was a white guy with a white beard?